No wired connection can deliver 100% uptime so the question isn’t whether your business will lose connectivity to the Internet, the question is how to protect your organization from loss and disruption when it does happen. 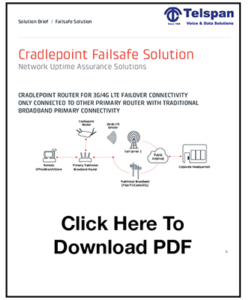 With Cradlepoint WWAN failover solutions using 4G/LTE, your organization can protect from these losses and mitigate risk to your brand. 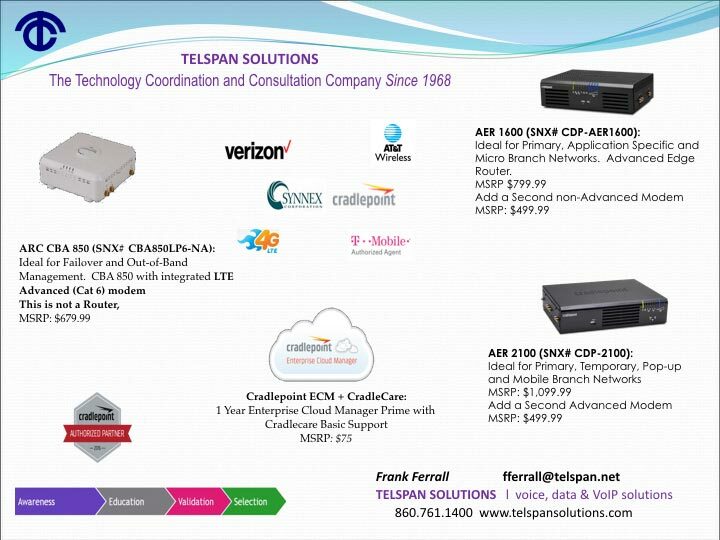 Fortunately, there are practical, convenient, affordable ways to ensure your business is not disrupted due to a Cable, DSL, or T1 related outage; and Cradlepoint is the leader in bringing these solutions to organizations worldwide. Cradlepoint solves the problem of lost connectivity, automatically, with quick and easily deployable solutions. Now organizations can maximize their Internet availability by bridging the inevitable gap with wireless WAN failover. Our solutions automatically detect access issues with primary connections and provide 4G/LTE network connectivity to avoid service interruptions. WWAN failover automatically provides the non-stop connectivity access you need to conduct business efficiently and cost-effectively when your primary goes down for any reason. Main-office availability everywhere: Now, branch offices and retail locations can enjoy the high availability that used to be limited to larger operations. Enterprise-class reliability: The cost of T1 reliability is out of reach for many businesses, but a small investment in failover to augment DSL or cable internet to the level of T1 coverage is not. T1 to the next level: Distributed enterprises that can tolerate no downtime, like bank branches, can use failover to stay up and running when a T1 line goes down. Connected to the cloud: Maximize the benefits of mission-critical cloud applications with less worry about losing your connection. Never say “no” to a sale: Protect your Point-of-Sale systems by using WAN DiversityTM for maximum uptime for maximum revenue in peak selling seasons. Out-of-Band Management (OOBM): OOBM to the console port of the primary router is a value-added layer to any distributed enterprise location’s failover solution. A secondary path to the devices at remote locations when the primary networks go down means minimized disruption and downtime. Cradlepoint failover solutions include this value-added feature.